Another band to break through from the city of Glasgow is Chvrches. Taking inspiration from 80s synth bands such as Depeche Mode and New Order, the pop triumvirate tour Japan on the back of their latest album — the glorious Love is Dead. Chvrches, since their debut album in 2013, have gone stratospheric and are regular arena players nowadays. 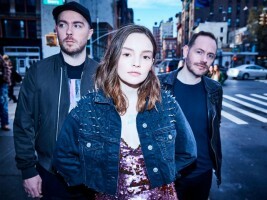 Led by feminist leader Lauren Mayberry, the band play two nights at Toyosu PIT in what promises to be a pair of cracking gigs.